Destination KOHLER offers distinctive dining destinations with sumptuous international menus that meet every taste. Whether having an early breakfast, light lunch, an afternoon snack with friends, or an elegant and intimate dinner with a loved one, the Village at Kohler has the perfect setting for every occasion. 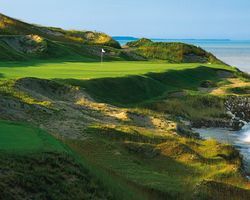 Whistling Straits is among the places in Wisconsin that provides endless opportunities for an exciting vacation. Aside from golf, guests can also venture the downtown shops and boutiques that offer authentic yet affordable gift items. At Destination KOHLER, one will never run out of fun things to do. From exploring the pristine rivers and wildlife sanctuaries, to fishing and shooting, every opportunity is just about spending a once in a lifetime relaxing and fun vacation. This golf course may only be booked as part of a "Stay & Play" package. If you want to book this golf course please see the "American Club" or "Inn at Woodlake" listing on the lodging page. 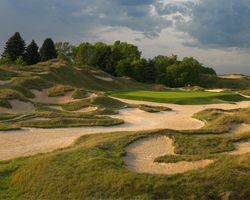 The second course at Whistling Straits, the Irish Course, is an inland grass-and-dune layout. It is an 18 hole course that features a 7,201 yards of golf from the longest tees on this par 72 course. Like the Straits course, it was designed by Pete Dye. Just inland from the great lake and interspersed by four meandering streams, the grassland-and-dunes aspect of the Irish is a deceivingly tranquil landscape. Both traditional and memorable, the Irish is full of unique challenges. This golf course may only be booked as part of a "Stay & Play" package. If you want to book this golf course please see the "American Club" or "Inn at Woodlake" listing on the lodging page. 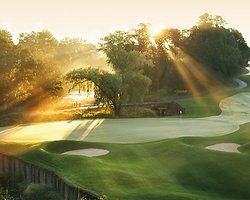 One of only 24 courses in the nation to receive Golf Digest's highest rating-five stars - Blackwolf Run is one of the most challenging and scenic destinations in North America. 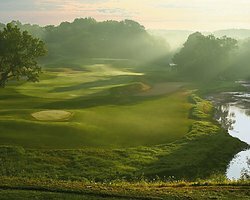 GOLF Magazine says Blackwolf Run "must be considered the nation's finest public-access course of modern times." This golf course may only be booked as part of a "Stay & Play" package. If you want to book this golf course please see the "American Club" or "Inn at Woodlake" listing on the lodging page. Professionals and amateurs of all skill levels can experience a day of golf like no other on the Meadow Valleys. Described as both subtle and devilish, it winds through meadows and charges across ravines, reflecting the natural features of the Wisconsin terrain. Scores of bunkers and water areas shored with railroad ties complement the Scottish influences in Pete Dye's work.